So I came up with this “Thai” Cabbage Slaw. I didn’t make a lot and that was a mistake, so I fixed the those amounts in my recipe. We had it for dinner, then as we were putting away the dishes, I made a second batch so we’d have some for the next day! We can attest it only gets better and better over time. 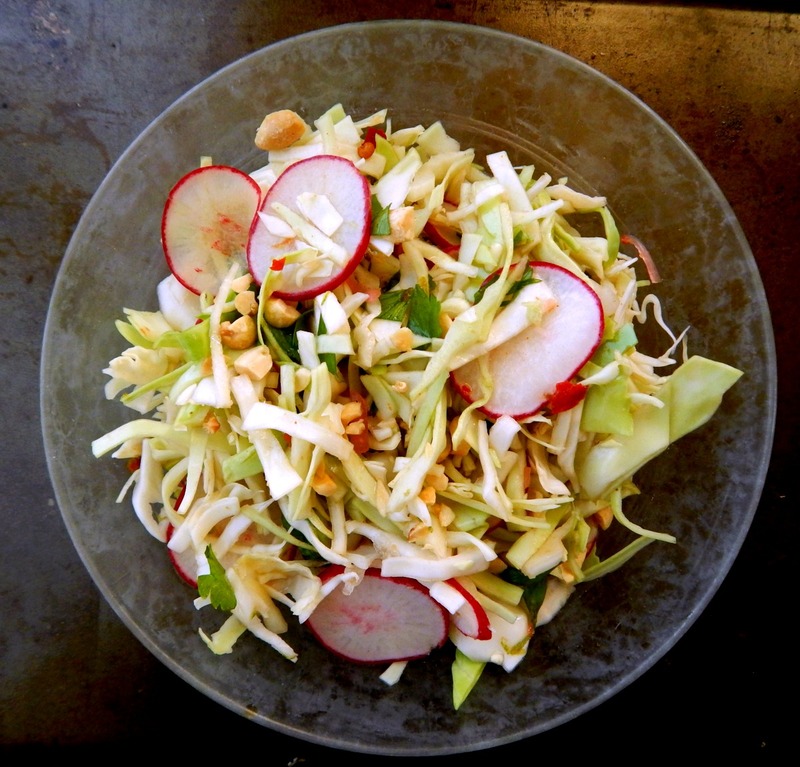 Thai Inspired Cabbage Slaw is very riffable. Add carrots, cucumber, red peppers or anything else that strikes your fancy. So there you go. Fast, easy, delish. The Thai Cabbage Slaw has a good bit of zip and a bit of sneaky heat, but not so much that one person that doesn’t care a lot for “hot” food had any difficulty, but this might be too much for children. The heat is in the garlic chili sauce, so feel free to tinker to your taste. Here’s a photo of Rhonda’s Thai Curry Chicken Skewers, just to whet your appetite! Mix dressing ingredients, including the zest & Juice if the lime together in a small bowl, Mix together, in a larger bowl, cabbage, scallions, radishes and cilantro. Add dressing and toss together. Garnish with peanuts when ready to serve. Serve immediately or make a day ahead. This entry was posted in Click here for Fabulous Food Posts and tagged Asian, Cabbage, cabbage slaw, Frugal Hausfrau, Honey, Lime, peanuts, radish, Salad, Side, Slaw, Vegetable Side. Bookmark the permalink. It IS isn’t it?! I’m so glad we live when we do and have access to so many recipes posted by fantastic cooks all over the world…To think w/o the internet, especially if I lived in my very small town in the midwest, I might never had any Thai food…I am going to have to click over to see your blog! Ooops. I can’t see it! Hi Laura, and thanks for the reblog! I appreciate it. I love a good Thai salad, and now it’s a slaw, too! Looks delicious. Where did you find the nutrition calculator? It’s so stylish! Thanks! More and more I find I am liking cabbage and with this Thai flavors it just sings. A perfect salad for summer! And for FF party, too! 😍Thanks for sharing, Mollie! Thanks, Jhuls, and thank you again for hosting! Hey Mollie– thanks for mentioning the kebabs– It just makes me happy that you liked them! and the slaw looks awesome (But I have a cole slaw weakness!!). Will try it soon. You the best blog-buddy!! hugs! Hi Mollie! I’ve only just begun to love slaw. Yum! A beautiful summer treat. Fresh and delicious. Thanks much! I always appreciate a reblog! Lovely post, this salad looks really fresh and tasty – perfect for summer! Fresh and colorful:) Thank you for sharing !